Improvement in intelligent mode, about 5 times faster than in version 3.18. The intelligent mode is used in help problems, but also in Selfmates when Black has only the King and 1 Pawn, 1 Knight or 1 Bishop. 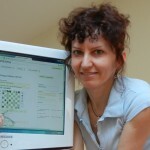 The last update (as of 12-Jun-2012) of WinChloe Echecs database is also available today for those, who uses it. The number of problems has increased till 431669! Julia’s Fairies site is added to the tourney’s section in WinChloe and 20 of original problems published here are already in WinChloe database – see the list of them I’ve exported from WinChloe! Read more about WinChloe at my site in the section Software/WinChloe or at WinChloe’s Home.